70% of the data we produce have locational aspect linked to it. This feature of data enables us to analyse multicriteria information together and utilise it in the context of decision making for a given geographical area. For example a modern outlook of decision making looks at the socio-economic, environmental, public health and technical information together. Innovative decision making tools are vital to process and analyse this wealth of information in an effective manner. This work package is aimed at research and development of innovative geoinformatics based solution to assist effective decision making in planning, new energy systems, environmental conservation, socio-economic development and public health applications. This work package is making use of IT and GIS to provide innovative solutions to decision problems involving the use of multicriteria information. 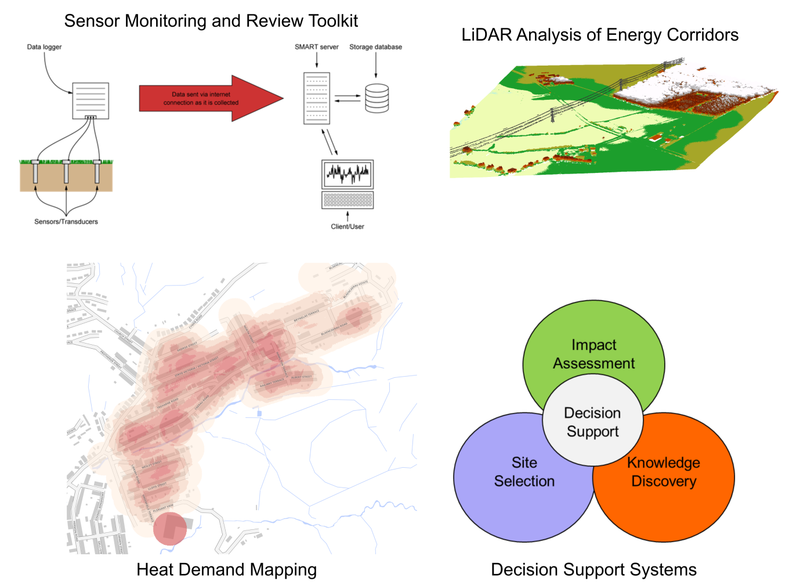 Work package activities involve creating energy demand/potential mapping, GIS analysis, Spatial Decision Support Systems (SDSS) development, remote sensing and image processing. Work package is involved in enhancing the capabilities of its earlier developed generic and integrated SDSS. The developed system is effective in commonly faced spatial decision problems including site selection, site impact assessment and spatial knowledge discovery. We are utilising Light Detection and Ranging (LiDAR) data for energy transmission corridor analysis, historic landfill sites monitoring and other applications involving the use of high accuracy digital elevation models (DEM). We are also involved in providing support to other work packages for work related to GIS mapping and analysis. For example energy-demand mapping, socio-economic and environmental aspects of new energy initiatives, locational aspects of efficient transmission and distribution networks. •	Seren-SDSS is a new integrated and generic Spatial Decision Support System (SDSS) that is developed to address a wide spectrum of spatial decision problems, related to site selection, site ranking, impact assessment and spatial knowledge discovery. SEREN–SDSS has been developed using open source geospatial technologies and provides a number of Artificial Intelligence (AI) and Multicriteria Decision Analysis (MCDA) modules to facilitate decision making. •	SMART is developed to visualise and analyse sensor data in near real time, with continuous automatic updates on the client’s screen. Range of values can be assigned to each sensor to raise alarm in case of peculiar data is received. •	E&D toolkit: The Equality and Diversity toolkit is a free software toolkit to assist Welsh Small and Medium enterprises to develop equality and diversity strategies and action plans. E-Learning modules have been developed as part of the tool for self-paced learning of issues pertaining to equality and diversity law.